A baby is normally considered a true bundle of joy in most families, however immediately you bring the baby home from hospital many things have to change in order to create a safe environment for the new arrival. Currently there are many products that are marketed as ideal for baby proofing your home. Although buying such products may be helpful to some parents it is better to rely on old common sense in order to ensure that your child has a safe environment. Making your home environment safe for the child may take time and a few resources but it is worth the effort. The living room is one of the places the baby is likely to spend a good deal of time in. This makes it an important place to begin when embarking on baby proofing your home. 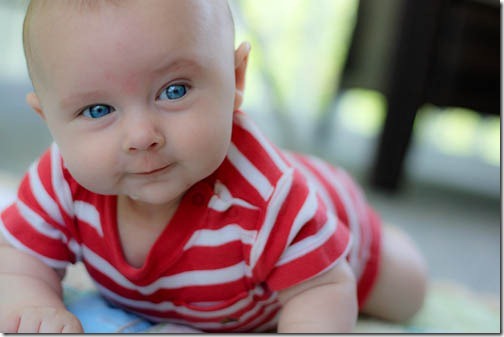 Begin by crawling around on all fours so as to get a baby’s view of the area. You need to pay special attention to furnishings, edges and hard corners of seats and coffee tables as they can cause serious injuries to a toddler, on the other hand heavy furniture can topple on determined climbers. To prevent accidents you need to move everything away from the windows to guard against the baby falling out of open windows. Mount bookshelves to walls so that they cannot topple over and fasten the TV to a table or entertainment center to prevent the baby from pulling it down. Look around for knick knacks lying around as these are a fair game for baby’s play, so if you do not want the baby to touch something keep it away. Candles and fire places are potential threats not to mention electrical outlets and cords. Most living rooms have railings which can lead to nasty falls if they have widely spaced slats. Falls and collisions with furniture are the biggest dangers to your baby in the living room. You can reduce these incidences by adding cushioned corner guards or edging coffee and side tables. Baby proofing your home also involves using a screen on the fireplace so as to keep it safe even when no fire is lit. Parents and family members are advised to avoid using candles since they can be easily knocked down. Taping electrical cords and covering outlets with safety plates is recommended unlike using plastic plugs which can pose chocking hazards to the child. Bathrooms are some of the places that can pose immense challenges for parents trying to make their home safe. Some dangers in the bathroom are quite obvious such as slipping on the wet surface or drowning. It is also important to be aware of dangerous appliances such as hot rollers and curling irons as they are likely to burn curious fingers. Other dangerous items that may not be so obvious include detergents, cosmetics, medicines or sharp objects such as razors or scissors. Keeping the bathroom door closed and installing protective covers on doorknobs will ensure that the baby cannot get in without you. Using slip-resistant mats that are nonskid will prevent falls and slips. You can protect the baby from being scalded by setting the heater at 120 0 Fahrenheit and below. It is also advisable to use the inside of your wrist to test the water before bathing the baby. Electric sockets near the tub and sink should be fitted with ground-fault circuit interrupters to cut off power when appliances get wet. You are highly likely to be distracted while cleaning or cooking in this room, so you want to ensure that your child cannot get into trouble if you turn your back for a second. If you have detergents and cleaning supplies in a low cabinet it is wise to move them to top drawers. Bottom cabinets should hold items that are safe for the baby to find such as pots, plastic containers and paper products. The same rule applies for drawers-move paper bags, plastics and sharp things to high drawers and put safe items on lower drawers. If you use mineral supplements and vitamins, lock them in a hard –to-reach drawer or cabinet as these look like candy but can poison a curious baby. In actual sense there is no such thing as baby proofing your baby’s environment totally. Even if there was, you cannot keep your baby in such an environment permanently. This means that there will always be risks and minor accidents are bound to occur from time to time. So apart from doing everything you can to make the child’s stomping ground a safe place, you should do everything you can to teach your baby about risks and dangers using words such as ‘dangerous’ and ‘hot’ with accompanying actions whenever relevant. Eventually the child will learn to associate such warnings with risks and dangers though you should never assume the will do that automatically.